Spring has sprung and warm weather has arrived, which means it’s time to get out there and have some fun. No, seriously, it’s OK to step away from your computer and put down your smartphone for a few hours to enjoy life. But while you’re out there doing whatever outdoor activities you enjoy doing, make sure you can relive all the action once your face is glued to your screen again. 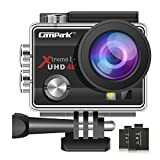 The Campark ACT74 Action Camera is a top-rated action camera with 4K resolution and a great wide-angle lens, and it comes with more than a dozen accessories including an extra battery and a waterproof case. All that for just $53 on Amazon! ◀2 Inch HD Screen + 170°Ultra wide angle lens▶This Action Cam with 2 Inch HD Screen and 170 degree lens, you won’t miss out on any background details and the support of 32GB on an Micro SD card will let you store all your photos and videos right on the camera. ◀WIFI Remote Control▶Action cameras compatible with iOS and Android system.The sports camera allows you control camera via the phone in real time, What is more, instantly send pics and videos via email or share them on social media easily.